pastabike makes Crostoli (Chiacchiere), Crackers, Squares of Pasta for Tortellini, Cappelletti, pappardelle etc. Tradition and innovation come together in a highly prized product: ATLAS 150 PASTABIKE. For this reason, we offer it as a gift idea for the person who savors the good taste of fresh Pasta and adds creativity to their kitchen. Other than the traditional shapes of Pasta which the machine can make, the PASTABIKE Accessory included in the packaging allows one to quickly prepare Noodles of various widths, Crostoli (Chiacchiere), Crackers, Squares of Pasta for Tortellini, Cappelletti, etc. The elegant and compact packaging shows our intent: to improve on what you already know. Pasta Machine for Home Use, completely in Nickel and Chrome Plated Steel. The PASTABIKE Accessory included in the packaging is made of Crystal-Clear Polycarbonate and Acetylic Resin, approved for food use. The products are guaranteed for 3 years. 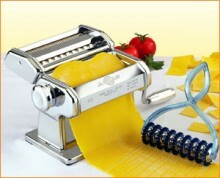 Click the button below to add the Atlas Pasta Machine with Pasta Cutter Set to your wish list.